1/ Reminders on Macs, iPhones, and iPads help you remember anything — Easy to manage, use, and share; always available, and (best of all), there’s nothing new to buy or learn. You can use your Apple devices to remember everything using just some of the apps and services already installed on your Mac and iDevices: the Calendar and Reminders apps, plus Siri. When you need to remember something, ask Siri (on your Mac, iPhone, or Apple Watch) to remind you of that thing at a specific time and date. The item is then recorded on the Inbox list in Reminders . Then, you’ll be reminded (with an onscreen alert and sound) at the appropriate date and time. Brilliant! But does Siri know where you live? Open the Settings app on your iPhone or iPad. Scroll down and tap Siri. Tap My Info and select your own contact card. 3/ Enable apps at log-in on macOS High Sierra — If there are certain apps you’ll always use the moment you start up your Mac, you can set them up to automatically log-in via System Preferences in macOS High Sierra (and it’s the same for previous versions of macOS, for that matter). Go to Users, make sure your own user account is highlighted on the left, then click Login Items. Click the + and you can choose an app, file server or pretty much anything else that should open when you log into, or start up, your Mac. Once you’ve added something, you can use the checkboxes to opt to hide it, though it will still be running in the background, thus instantly available. Select the file or folder that you want to import. If the notes that you’re importing are organized in folders, click Options in the lower-left corner to keep them organized. After your notes import, you’ll see a new folder in the Notes app called Imported Notes. Then you can organise them into any Notes folder that you want. 5/ Remove a Time Machine backup disk — If you back your computer up to multiple drives using Time Machine, you may be familiar with the notification that tells you that you haven’t been backed up in [insert long amount of time here]. You see, if you’ve configured more than one Time Machine disk, your Mac will take turns backing up to each of them when they’re plugged in or connected over your network; you’ll get the warning when one of your disks hasn’t been used for a while, even if the other backups are working fine. If you don’t see the circle-clock near the top-right of your screen, you can instead use the Apple Menu to open System Preferences then click Time Machine. Whichever way you get there, though, the Time Machine preference pane has the option to remove a disk under the “Select Disk” button. Within that section, you’ll find your list of backup disks at the top. Click the one you want to get rid of, and then choose Remove Disk. 1/ Use a keyboard shortcut for display mirroring in Mac OS High Sierra — Display mirroring is when your external monitor and laptop display show the same screen, instead of dividing the view between. The shortcut to the System Preferences > Displays > Arrangement > Mirror Displays command is Command-F1, which turns display mirroring on and off in macOS High Sierra. 2/ Use Night Shift in macOS High Sierra — macOS High Sierra has Night Shift, a feature brought over from iOS. 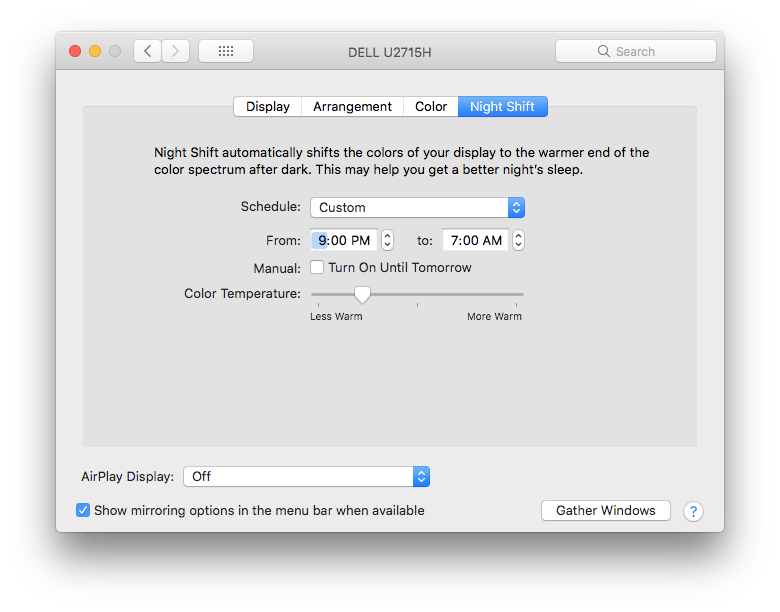 It helps you reduce the amount of blue light you’re exposed to during the evening by shifting the display of a Mac to a more yellow tone, which is supposed to assist you later, together to sleep. The proliferation of electronics with screens, as well as energy-efficient lighting, is increasing our exposure to blue wavelengths, especially after sundown, and this may affect sleeping patterns. Open the System Preferences app. You can turn Night Shift on or off. Set it to come on from sunset to sunrise — or you can use the Customize options to implement it for the hours of your choosing. You can also adjust the colour temperature via a slider, but warmer settings may affect the appearance of some onscreen motion. 3/ Disable Split View in Mail — For those who use Mail in full-screen mode, you may have noticed that High Sierra now defaults to a split-screen view when you’re composing a message or when you’ve double-clicked on an email to open it in its own window. If you’re not a fan of this, it’s really easy to disable. Choose Preferences from the Mail menu at the top of your screen, then click on the General tab. ‘Prefer opening messages in split view when in full screen’ is the checked box, so uncheck that box. When you do so, Mail’s full-screen mode reverts to its previous behaviour. 4/ Block Cross-site tracking in Safari — Apple promised a way to block websites from cross-site tracking in Safari in macOS High Sierra and iOS 11. The idea is that you won’t see ads for a product you just looked up when you on, say, a news site. If you’re still seeing ads like that after upgrading to Apple’s new operating systems it’s easy to see if preventing cross-site tracking is really enabled. You can do this on iOS, too. Prevent Cross-Site Tracking in iOS 11 involves a trip to the Settings app, under Safari. 5/ Show full website addresses in Safari — Starting around OS X Yosemite, Apple has chosen to have Safari hide full website addresses by default. Instead, it only shows a basic name domain in the field at the top of browsers. Go into Safari preferences by pressing Command (⌘) + Comma, or from the Safari menu, choose Preferences. Click on the Advanced tab at the far right. The first menu item you’ll see is the Smart Search Field. Check or uncheck the box to turn the feature on or off: checking the box will show the full URL. This lets you quickly see which part of a website you’re in. Open the Camera app and make sure the rear facing camera is enabled. Point the camera viewfinder at the QR code. Make sure the code is entirely visible in the view finder. You’ll see what action the QR code can perform (add event to your calendar, open page in Safari). You don’t have to to press the capture or shutter button. Just pointing the camera and holding it steady at the QR code is all you need to do. 2/ Stop apps from asking for reviews in iOS 11 — If you dislike the pop-up windows from apps constantly asking you to leave a review in iOS 11, you put an end to it. Tap on iTunes, then App Store. Turn the In-App Ratings & Review option off. Phew! 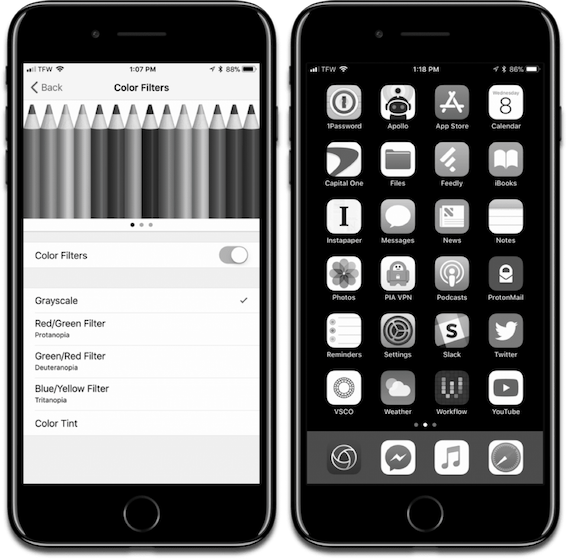 3/ Add the Magnifier to Control Center — The iOS Magnifier feature is a way to use your device as kind of a low-powered set of binoculars or a magnifying glass. It has been around since iOS 10 – a triple-click of the Home button boots it up if you have turned the feature on in Settings. In iOS 11, tough, you can now add an icon for it into Control Center. First, visit the Settings app and look for the Control Center section. Tap that, then Customize Controls. Scroll down and touch the plus button next to Magnifier and it’ll appear at the top of your list under the Include section. You can also drag any of the three-lined icons shown to the right of the tools above to set the order in which you want them to appear in Control Center. The next time you bring up Control Center by swiping up from the bottom of your Home Screen, you’ll see your new addition. 4/ Change Key Frames in Live Photos — One of the newest features in iOS 11 is the ability to change the key frames in Live Photos [a gimmick I’ve never got, but if you use it …]. The key frame is what appears in Photos to show what the sequence is, and it’s typically chosen automatically when you snap the picture. Tap on the Live Photo you want to change, then, tap Edit in the top right corner. You’ll see a slider at the bottom of the photo with all of the frames available within the Live Photo. To change the key frames in Live Photos, you move the selector of that slider back and forth until you find the frame you like. Once you’ve found the frame you prefer, tap on Make Key Photo to set the key frame of the Live Photo to the frame you like best. 1/ How to work on files together in macOS High Sierra — It’s easy to work on files together in macOS High Sierra. When you share a file in iCloud Drive, you and your team can all work in the same document – and never wonder who has the latest version. Open the Finder, then choose iCloud Drive or a folder you’re syncing to iCloud (such as Desktop or Documents). Select a file (sorry, you can’t share a folder) and click the share button atop the window. Or just right-click a file and then click Share. You’ll see an Add People option in the share menu. You can use Mail, Messages, Twitter, Facebook, AirDrop. When you select one of these options, a link to your file will be sent instead of an attachment. There’s also a Copy Link button on the Add People menu. It lets you copy the link to a file to your clipboard to paste when you wish. 2/ Share notes form iBooks and macOS High Sierra — iBooks started in iOS, and the ability to share or export notes is a little better on iOS than it is in macOS High Sierra. Still, it’s not as intuitive or obvious as it should be. Start with a note. To view all notes you have added to the book (ie an iBook in the iBooks app), tap the table of contents icon, then the Notes tab at the top. But you have to Tap Edit Notes > Select All. The notes get a check mark from being selected, and the Share button lights up. When you tap Share, you get a new menu with one option by default: Mail. Tap the Mail icon, and an email sheet will open where you can decide where to send it. 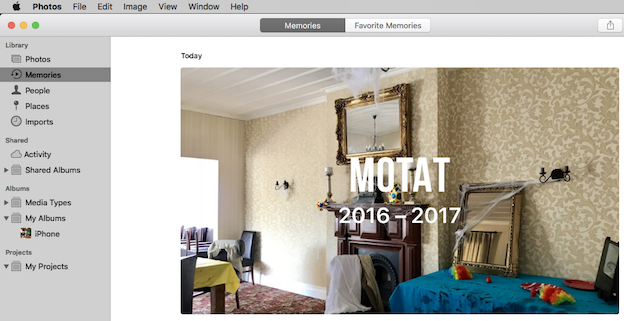 You can share notes from iBooks in macOS High Sierra, too, but it’s even less obvious. First, get to your notes by tapping the Notes icon. Click on a note to select it. If you then right click on the note (you can also just right-click to select in the first place), you get the option to Copy, or to share via Mail, Messages, Notes, Twitter, or Facebook, as shown below. Here’s the bad news: you can only export/share one note at a time. While you can shift-click or option-slick to select multiple notes at one time, rick clicking on any of them deselects all but the one you’re right-clicking on. You’d have to share one note at a time and then copy-paste each of them into an email or other app to share them all at once. 3/ Pin a note to the top of your list in macOS High Sierra — Remember that Notes syncs across devices and Macs signed into the same iCloud account already, so it’s already ‘collaborative’. If you have a note that you update often, like a to-do list or shared brainstorm? 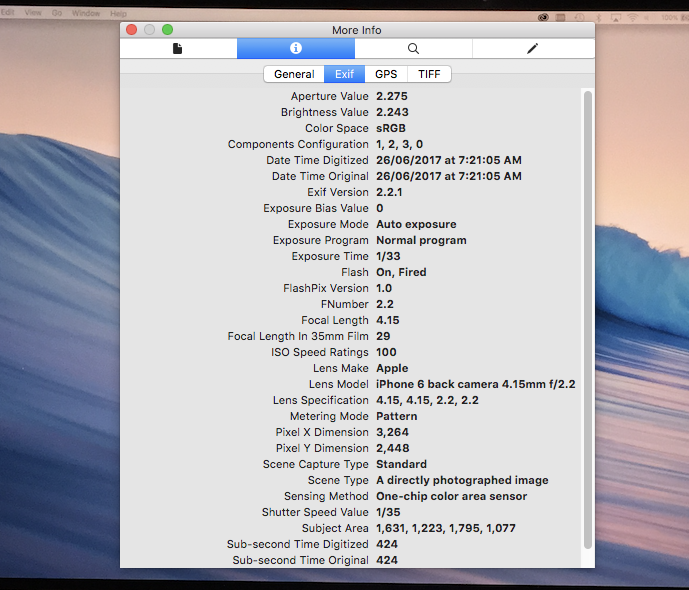 You can pin it to the top of a list in macOS High Sierra. 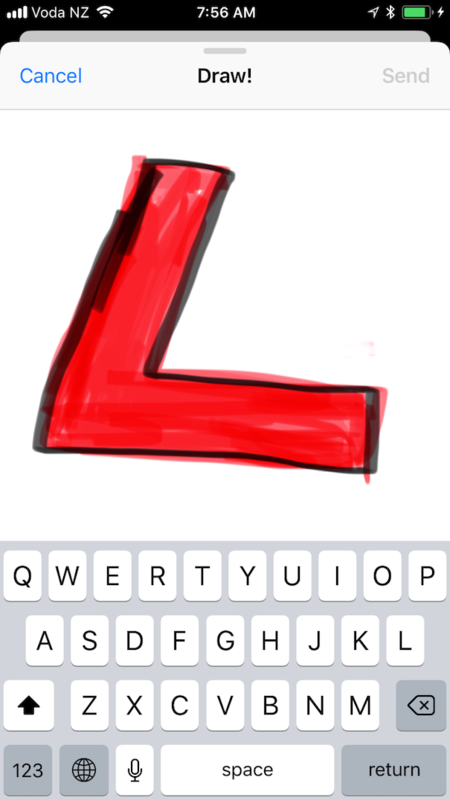 Launch the Notes app and choose a note. Click on File in the App menu at the upper left of the screen, then choose Pin Note. The note is always easy to find. It will remain at the top of your list under a section called Pinned Notes, no matter what changes you make to the rest of your notes, or on which device. Pinned notes sync across all of your devices connected with the same iCloud account. To unpin a note, launch the Notes app and choose a pinned note. Click on File in the App menu, and select Unpin Note. 4/ Use Keyboard Shortcuts in Apple Notes — You can use keyboard shortcuts in Apple Notes. It’s really fast to navigate and perform tasks on your Mac with keys, so try to do this whenever you can, at least when doing tasks in an app. Here’s a list of the commands. 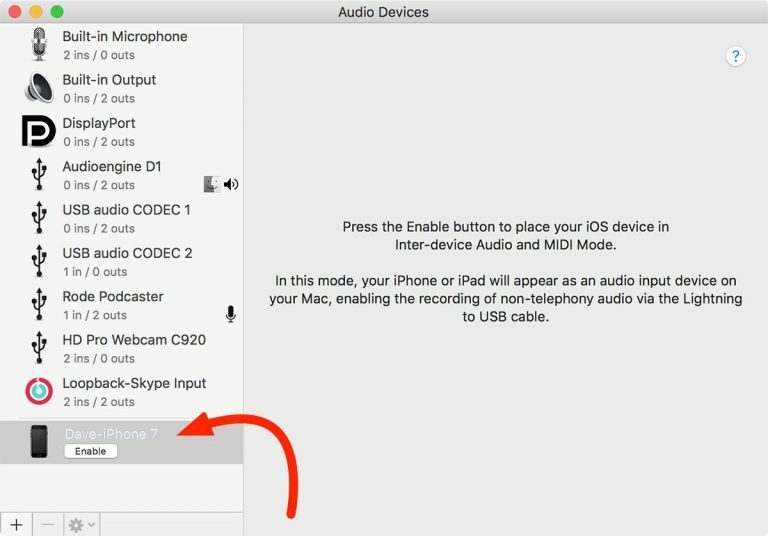 5/ Use your iPhone or iPad as an Audio Input on your Mac — Your iPhone is a powerful communication device, so what if you want to play or record some of the audio from it through your Mac—like maybe for a podcast you’re recording. Turns out it’s easy and your Mac can even see your iPhone as just another audio input source. Read on to learn how to set it up. To play audio from your iPhone or iPad you’ll need to a Lightning to USB cable, like the one that came with your device for charging and syncing. Connect your iPhone or iPad to your Mac with the cable, and then launch Audio Midi Setup on your computer. It’s in Applications/Utilities. Now select your iPhone or iPad from the device list on the left and click Enable. Your iPhone or iPad will show up as a new input source in Sound Preferences so any audio playing on the device will play through your speakers, headphones, or other selected audio out device on your Mac. This is a cool and easy way to use the audio on your iPhone in a podcast without having to find a way to first export it. The only limitation is that phone calls won’t play out – so you can’t use this as a way to record conversations. 1/ How to Enable Type to Siri in macOS High Sierra — Just like in iOS 11, you can enable Type to Siri in macOS High Sierra. This is a feature that lets you type queries to Siri, just like you would a search engine. It’s useful for people who may feel awkward talking to their iPhone or Mac. It’s also helpful in certain situations where silence is a virtue, like in a library. Here’s how to turn in on in macOS. Open System Preferences, then go to Accessibility. Scroll to the bottom and click on Siri in the left sidebar. You’ll see a checkbox that lets you turn on Type to Siri. Next, go back into System Preferences and click on the Siri icon. You can enable or disable voice feedback, should you wish. 2/ Check a flight status using Spotlight — High Sierra has made it easier to check the status of a current or upcoming flight. Click on Spotlight’s magnifying-glass icon in the upper-right corner of your screen or press Spotlight’s keyboard shortcut (Command-Spacebar). 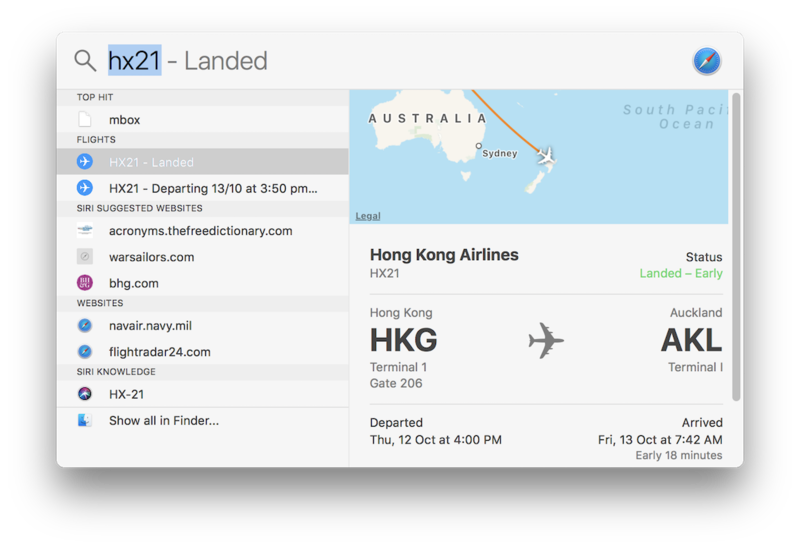 Now type in the airline and flight number into the search bar that’ll appear. If you end up with multiple results in the left-hand list, click through them to find the particular flight you’re looking for (and get more information on it). You can also tell you have got than one result by the little pips at the bottom of the right-hand pane. This indicates you could swipe to view each of the results in turn if you’d rather do that than click them. Allow All Auto-Play – all videos on the site can autoplay. Stop Media with Sound – only videos that don’t have audio will autoplay. Never Auto-Play – no videos can autoplay. Finally, there’s a drop-down at the bottom of that window that’ll allow you to change the global setting. By default, Safari should stop all media with sound, but if you’d like to be a bit more heavy-handed, you could switch this to Never Auto-Play. Yes! 4/ Set up Custom Reminders — You set a reminder for yourself that repeats on Monday, Wednesday, and Friday, or configure one that pops up on the first weekend day of every month, whenever that happens to fall. 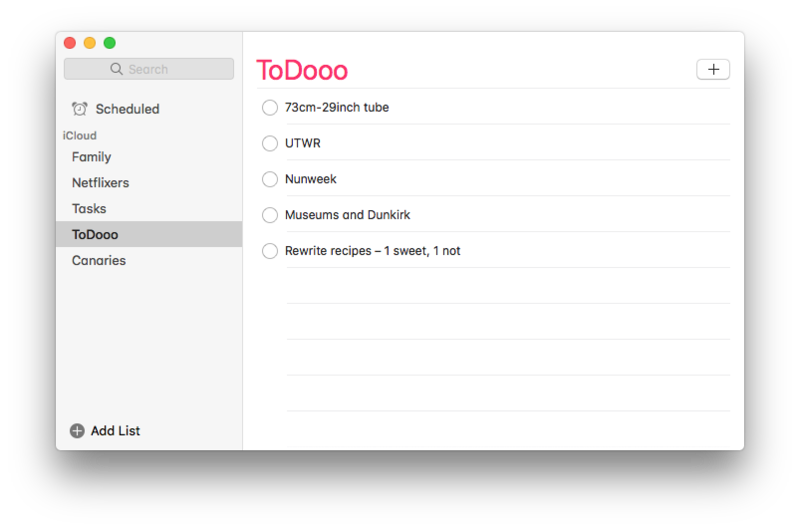 Open the Reminders app and click on a blank line to type in the title of your item. Hover your cursor over your new reminder afterward, and you should see a small ‘i’. Click that and you’ll see the options for how you’ll be reminded. To set up a custom repeat, select On a Day, and then click next to the Repeat section. A drop-down menu will offer you a Custom choice. Set a frequency for your repeated reminder: daily, weekly, monthly or yearly. Every frequency type has its own options; for example, weekly lets you pick multiple days of the week on which to get your notifications. You can do the same thing with Monthly or use the drop-down menus at the bottom to get reminded on, say, the first weekend day of every month. Just click Done to commit. 5/ Use ‘Grep’ to Find Matching Lines — This one’s a bit more pointy-headed. The Terminal doesn’t care if you know what you’re doing, which is why it’s always a great idea to be careful what you type in it! But one command that’s simple to use (at least at its most basic level) is grep. You can use grep to pull lines that contain search terms out of a text file. Here’s how it works: Let’s pretend this text file of mine has many hundreds of lines of data that I need to paw through. Terminal lives in your Applications>Utilities folder. It gives you a prompt to start (ending with a dollar sign) – type ‘grep test’ (without the the single quotes). Now you have to tell Terminal which file to run things on. An easy way to do this is by making sure to type a space after your search term, and then drag and drop the file you want to search onto the Terminal window. The program will fill in the path to the file for you,. If you then press Return on your keyboard, the Terminal window will fill up with the lines that match your search. There’s a lot more detail, plus pictures, at the Mac Observer. 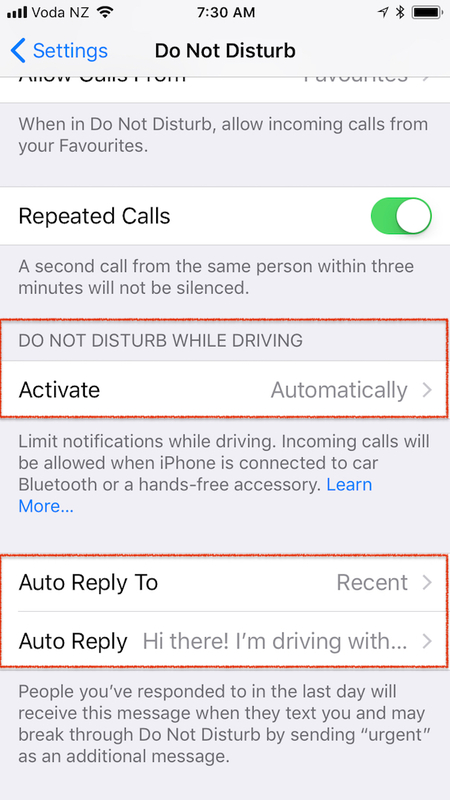 1/ Manually implement Do Not Disturb mode in iOS 11 — The Do Not Disturb feature of iOS designed to help users stay more focused while they’re behind the wheel of an automobile. It usually kicks in automatically, but you can set it manually. Do Not Disturb limits notifications on demand or during a schedule you set up. Along with limiting or muting notifications, it can also reply to contacts who send you messages while you’re driving, giving them a heads-up that you’re on the road. Open the Settings app, tap Do Not Disturb, scroll down to Do Not Disturb While Driving. Tap on “Activate” to choose how you want Do Not Disturb While Driving to be turned on. If you don’t want to use Do Not Disturb While Driving, set it to manual. 2/ Using the new Messages effects — A couple of new effects are available under iOS 11, dubbed “Echo” and “Spotlight.” To see them, you’ll first type your message, then press with a little force (if your device supports 3D Touch) or press and hold briefly (if it doesn’t) on the blue sending arrow. You’ll then see two tabs at the top for the types of effects you can use: Bubble and Screen. The Bubble effects only animate the message bubble itself, not the whole screen. Invisible Ink, for example, will require your recipient to tap your message to reveal it. The new iOS 11 effects are under the Screen section, though, so touch that tab to open it. Once you’re there, you’ll see the first new effect: Echo. The second new screen effect is called Spotlight – you’ll see it when you swipe from right to left. When you’re satisfied with the effect you picked, just touch the blue sending arrow again, and your recipient will see your creation. Be sure, though, to listen to these with your volume up at some point, too, because the sound effects are pretty amusing. 3/ Choose which Control Center widgets to use — The old iOS Control Center had a specific set of controls: Airplane mode button, a Do Not Disturb toggle, a flashlight button, a timer shortcut, and so on. Now, it you don’t want a particular button showing up in Control Center? Just remove it using the Customize setting [sorry about all the US spellings but sic]. For sample, if you want to keep the Control Center flashlight but could do without the Calculator shortcuts, tap Settings, Control Center, Customize, then start tweaking. To remove a setting from Control Center, find it in the Include section, tap the red circle next to its name, then tap the Remove button. To add a control, scroll down to More Controls, then tap the green “+” button. You can rearrange your custom Control Center buttons by holding and dragging the three-line handles next to their names. 4/ Tap and hold a Control Center button to see more options — Simply tapping the Flashlight button in Control Center on an iPhone toggles the flashlight on and off. But if you tap and hold (or “deep press” on an iPhone 6s or later) the Flashlight button, you reveal a five-level slider that lets you adjust the brightness of the flashlight. Tap and hold the Brightness slider, and you’ll find a button for Night Shift, the sleep-friendly iOS feature that adjusts the color of the screen to warmer, eye-soothing temperatures. Tap and hold the Timer button and you’ll get a slider that lets you change the length of the timer by swiping up or down. If you tap and hold the Camera button, you’ll reveal a pair of handy shortcuts: one for Take Selfie, another for Record Video. Tap and hold others to reveal more hidden Control Center functions. 5/ Turn off iOS 11 Smart Punctuation to avoid data entry problems — An unexpected side effect of Apple’s new Smart Punctuation feature in iOS 11 has manifested and is causing some problems with apps that use Core Data to store strings. Here’s how to turn off Smart Punctuation, and why you might want to for now. First spotted by SongSheet app developer Gabriel Hauber, Smart Punctuation is periodically inserting a null byte. Specifically, if the user enters two dashes, it generates an en-dash. If the user enters three, then the en-dash is displayed, but a null-byte is appended after the en-dash. The null byte insertion prematurely ends a string, which as a best case causes a truncation of data —but can also lead to instability and crashing. In all likelihood, Apple is already working on a fix, and given a brief perusal of developer documentations, it appears to be able to be temporarily disabled by app developers. However, to fix the problem on your personal devices and sidestep the issue for now in its entirety, here’s how to turn off the feature. In Settings, tap General. Then, tap Keyboards, and toggle Smart Punctuation to off. 1/ A Safari finger gesture opens links in the background Immediately — In iOS 11 there is a way to open links immediately in the background while browsing Safari. You’ll need to go into Settings>Safari and turn on Open Links, and choose to open links in the background. Now you can long-press the link, or 3D Touch the link. This lets you open web pages without navigating away from the current page. (This feature may have been around at least since iOS 10, and it works on iPhone and iPad). 2/ Using AirDrop in iOS 11 — The first, and arguably easiest, way to toggle AirDrop in iOS 11 is through the Control Center. Open the Control Center by swiping up from the bottom of the screen. The platter in the top left corner will show you Airplane mode, Wi-Fi, Bluetooth, and Cellular Data, if you have it on your iOS device. If you long-press or 3D Touch deep press on that platter, it will open up a couple more options (left) for you. One of those is AirDrop, which you can just tap on. Then, choose whether you want the feature off, available to everyone, or available to just your contacts. If you prefer, you can also find the toggle for AirDrop in the Settings app. 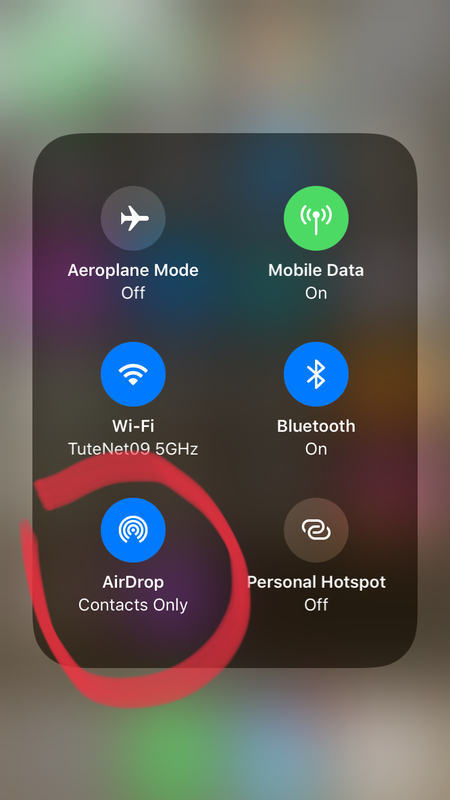 Open Settings -> General -> AirDrop. Then you can find the same configurations for AirDrop as in Control Center: Everyone, Contacts Only, or Off. 3/ Focus Lock the iPhone’s default camera — The iPhone’s default camera app is good, but sometimes there are one or two features you’re looking for that it doesn’t have, such as locking the focus or shooting in RAW. But it turns out that you can focus lock the camera, it’s just hidden away behind a gesture. Focus lock means that the camera will stay focused on a certain object even when you move around. Here’s how to do it. Locking the focus isn’t new in iOS 11, but since the user interface is different it’s time for a refresher. You may already know that when you’re taking a photo with the default camera app, you can tap on the screen to focus on something specific in your frame. Now, to focus lock, you have to press and hold anywhere you want to focus on for a second. The yellow reticle will flash a couple of times, and it will lock onto the object until you close the app or tap on another part of the screen. After you lock the focus you can tap on the sun icon and swipe up or down to control the exposure. Swiping down will darken the image and lower the intensity of highlights so you get more detail. Select a photo you want to use as your custom watch face. You can pick up to 10. Now head over to the Watch app and select your new custom watch face. If you included multiple photos in your custom face they’ll change when you lift your watch. 5/ Customize taps for each of your AirPods — Take your AirPods out of their case (or just open it), launch your Settings app on your iPhone or iPad, and then touch Bluetooth. Under that section, you should see your AirPods by name. Touch the “i” next to them first. On the subsequent screen, there’s a “Double-Tap on AirPod” section, now separated into left and right. So just touch the side you want to configure, and you’ll see your choices. Tap the behaviour you want, go back to set up the opposite AirPod, and then you’ll see what you’ve chosen out on the previous Settings > Bluetooth > AirPods screen. iOS 11 is imminent – most of these will work for that too, though, so here’s to 10. 1/ Save a PDF to iCloud — If you can print a particular item in iOS 10, you can save it as a PDF. You can also share a newly created PDF through a message or an email. First open any app you can print from. In this case, I’m using Safari, so I’ll start the printing process by tapping the Sharesheet icon (an upwards arrow in a rectangle – it’s circled in the image at left). Once the options screen opens, swipe to find Print along the bottom row of icons and once you tap that, you will see a preview of how my webpage would look if you printed it. You can also do the typical sharing stuff with your PDF: add it to a message or an email, or other options. 2/ In Notes on iPhone/iPad, use an On My [Device] account — If you’re really concerned about the security of data you type into your notes, you should probably lock the important ones. Also, though, you can choose to store certain notes only on one device or another as opposed to syncing them all through iCloud. You could keep a list on your iPhone but not pull it onto the family iPad that’s signed into your iCloud account, for example. Visit Settings on the device you’d like to store local notes on, and then go to the Notes section. At the bottom is a toggle for adding an On My [Device] account. Turn that on, and you can choose where to add any new notes by visiting the section in question from your main Notes window; for example, choose Notes under On My iPhone to create or edit anything that lives only on that one device. 3/ Stop; collaborate and listen — If you’re writing a note and look at the top of your screen, you’ll see a silhouette icon. Tap that, and your device’ll walk you through adding someone as a collaborator. 4/ Save media you add to Notes — If you need to remember to buy or do something, taking a picture within a note is a good way to accomplish that. To do so, just tap on the little plus button within a note if you don’t see the toolbar then pick the camera icon to snap a picture. The default means that none of those saved images and videos are added to your photo library, but if you’d like to switch that up, visit Settings> Notes and change that option. Afterward, the media you save in Notes will be saved in Photos, too. 5/ Automatic reminders for events you set in Calendar — There’s no need to manually add a reminder to each and every meeting in your calendar. Instead, you can set the iOS Calendar app to automatically add a reminder for any new events you create. Tap Settings, choose Calendar, then tap the Default Alert Times setting. Now select automatic alert times for up to three different types of Calendar events: birthdays, generic events and all-day events. For birthdays and all-day events, you can set a default alert anywhere from a week before to the morning of the event. For standard events, your auto-reminder choices range from a week before to the moment the event begins. You can even add a Time to leave reminder that’ll let you know when to start commuting to an event, provided you’ve filled in the event’s Location field. Just enable the Time to Leave setting. Your dock in macOS is more powerful and interactive than you think, and it’s configurable. 1/ Open Microsoft Office docs in macOS Sierra without Microsoft Office — If you need to open (or export Microsoft) Office docs in macOS Sierra, but don’t want to buy and install the massive Office suite, you can use Pages, Numbers, and Keynote to open and save docs created with Microsoft Office. Every new Mac has these apps o them already, for free. If not, Pages, Numbers, and Keynote are available from the Mac App Store. To open a Microsoft Office doc, drag it from a folder or even from within an email, and drop it on the Pages icon in the Dock – when the Pages icon goes dark, release the mouse or trackpad and Pages will convert and open the file. For an Excel doc, drag it over the Numbers app in the Dock and let go; Powerpoint over Keynote. 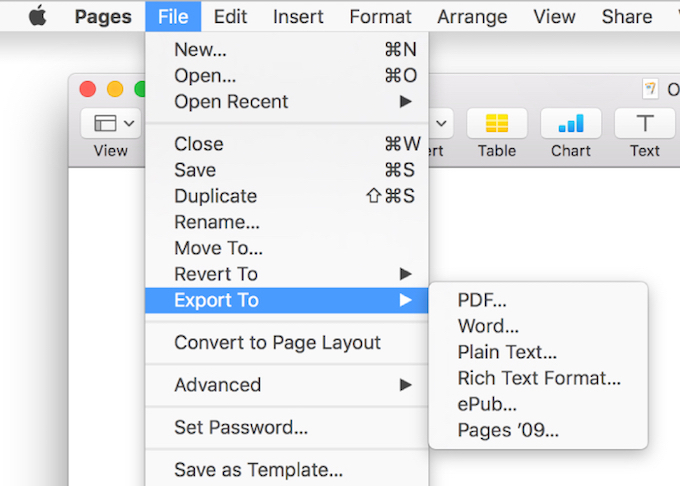 To export Pages, Numbers or Keynote documents as Word, Excel or Powerpoint, say for someone on a PC who only has these apps, choose File>Export to and select the correct app from the pop-out. Easy. 2/ Put the iCloud Drive icon (and others) in your Dock — In Finder, in the menu bar, click Go, then Go to Folder near the bottom. 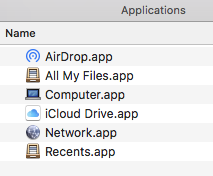 Here you’ll see six different apps that represent some Mac’s services: AirDrop, All My Files, Computer, iCloud Drive, Network, Recents. You can drag and drop any of these into the dock. 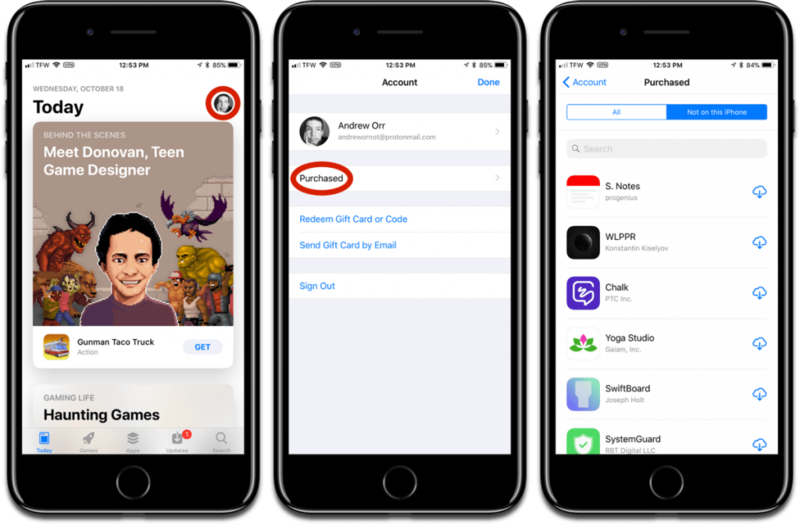 Unfortunately, they aren’t dynamic app icons unlike most, including Pages, Numbers and Keynote as above, Mail and others: if you drag a file onto the AirDrop icon, it won’t automatically open AirDrop and find your devices. You can only click on them, so it’s basically just a shortcut to these services. But now you won’t have to open Finder first before you jump to these locations. Hopefully it will save you a few precious seconds in your workflow. 3/ Set the default wireless network in macOS Sierra — By default, macOS Sierra attempts to join the wireless network it was most recently connected to. However, if you have a Wi-Fi network you use most often, you can set it as the default network in macOS Sierra. Choose Apple menu > System Preferences, then choose Network. Click Wi-Fi in the list at the left, then click Advanced. If Wi-Fi isn’t in the list, make sure your Mac has wireless capability, then click the Add button (a plus sign) at the bottom of the list. Click the Interface pop-up menu, choose Wi-Fi, give the service a name, then click Create. If the network you expect to see isn’t in the preferred networks list, click the Add button at the bottom of the list, then click Show Networks. Click the network you want to add to the list, then click Join. If the network is protected by a password, enter it. Drag the the network you want to give highest priority to the top of the preferred networks list. This is the network your computer will try to join first. 4/ Hide All Day Events in Calendar — Apple has built in a way to hide all-day events, so you could use that to temporarily get more breathing room for your own scheduled items. To do so, you’ll just deselect Show All-Day Events under the View menu. 5/ Create your own keyboard shortcuts — Make note of any menu command you’d like a faster keyboard shortcut for, click on the Apple Menu, choose System Preferences and visit the Keyboard section. Here, click the Shortcuts tab and select App Shortcuts from the sidebar. That section has a plus button near the bottom, so if you click that, you can add your custom shortcut. In the first drop-down, choose the program you’re applying your shortcut to. Then type in the command, indicating the menus and submenus it’s under with the ‘hyphen-greater than’ combo (shown above). Be sure to include any capitalisation and punctuation; if you need to type an ellipsis, the keyboard shortcut is Option-Semicolon. Once you’re sure you have the command typed correctly, add in the Keyboard Shortcut field by just clicking within it and pressing your desired shortcut – for example, the Command key + Option + 9. You’ll see your creation appear in the list after you click Add – your shortcut will also show up within the app you added it to. Be sure, though, that the shortcut isn’t a duplicate of one already in use. If that’s the case, yours may not work, and you’ll have to come back here to System Preferences > Keyboard > Shortcuts > App Shortcuts and click on the original shortcut you created to press a new one. (You may be able to add a custom keyboard shortcut without putting the menu hierarchy in (eg, using Show All-Day Events instead of View->Show All-Day Events), but doing so may mean that your shortcut acts flaky or stops working altogether. 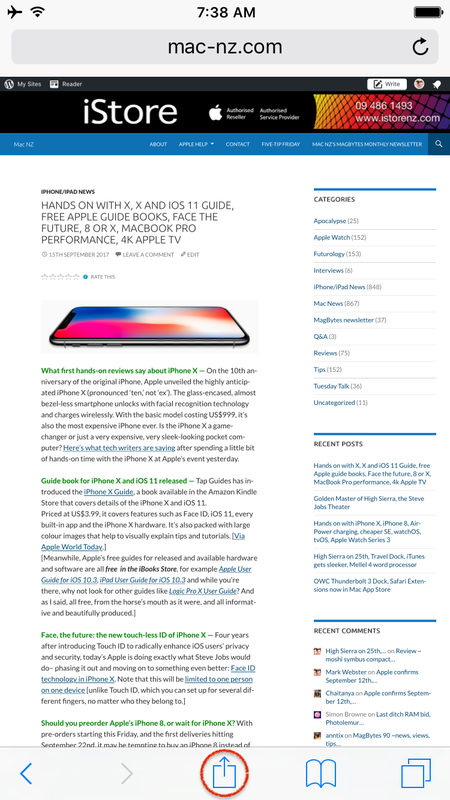 If you’ve got any more questions, feel free to check out Apple’s support article on this topic, as it’s fairly extensive. (From Mac Observer). Welcome to September, the month Apple launches an all-new iPhone! Until then lets rev up our existing iPhone use a little. 1/ Selectively control Read Receipts for iMessage in iOS 10 — A read receipt in iMessage is simply a feature designed to let your contacts know when you’ve read their message. You can go into Settings to turn this on and off at will, but on iOS 9 and before, this setting turned it off for all contacts. With iOS 10 however, it’s possible to control read receipts for each of your contacts if they also have iPhones (otherwise the option is simply not available). Now you can let your boss know when you’ve read her message, while turning the feature off for that weird guy you met on Tinder [to quote Mac Observer!]. 2/ Modify AirPods behaviour — Once iOS 11 ships, which may be as soon as 12th September, you will have more options. For now, in iOS 10, you can change how your AirPods react when you double-tap on them, or switch what happens when you put them in your ears. You adjust these options on your iPhone or iPad. To get started, open your AirPods’ case or take them out of it, then visit Settings > Bluetooth on your paired iOS device. There you’ll see a list of all of the Bluetooth devices you’ve added. If you don’t see Connected next to your AirPods, tap their name to connect. 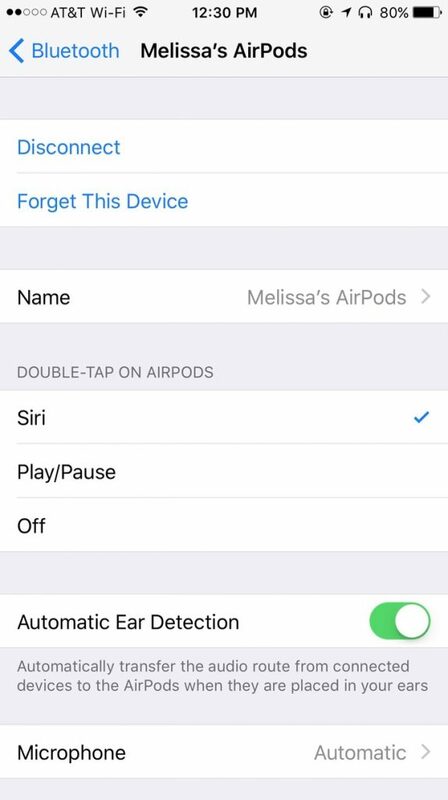 Within this option, you can disconnect your AirPods (or have your device forget them entirely), change their name, or set what happens when you double-tap one of them. This is probably the most useful adjustment, as you could configure your AirPods to play/pause instead of invoking Siri with a double-tap. Also on this screen are Automatic Ear Detection, which you can turn off if you don’t like your audio automatically being sent to your AirPods when you put them in your ears—and the Microphone setting. This lets you configure which AirPod you’d like to always be your microphone. 3/ Using 3D Touch in Spotlight — With a recent iPhone (6s/6s Plus or 7/7 Plus), you’re probably accustomed to your favourite uses for 3D Touch: looking at notifications within folders, opening new private tabs in Safari etc. You can also use Spotlight searches to find apps, and then if you press on a result within the Spotlight interface, you’ll get the same options you’d get by 3D-touching the app itself. Start by swiping down on your home screen to open the iOS Spotlight search function, then type the name of an app into the search field at the top. Press with a little force on the app in the results to get the same Quick Action choices you would get from using 3D Touch on the app icon on the Home screen. You can use this, for example, to quickly find the Camera app and use its Quick Actions. 4/ In iOS 11, set up and customise Do Not Disturb While Driving — For those already beta-testing the next generation of iOS, you can do this now For the rest, you can do this soon. iOS 11 will add Do Not Disturb support for driving so you won’t get distracted while you’re cruising around town. You don’t have to use it, but if you do, it’s easy to set up and customise. Once iOS 11 is installed on your iPhone there’s a good chance you’ll get a dialogue asking if you want to turn on DND when you’re driving. The dialogue will pop up after you move off in your car. DND While Driving can activate automatically when connected to your car’s Bluetooth, or manually. If you choose Manually, you will need to use the Do Not Disturb button in Control Center to activate the feature. Select No One, Recents, Favorites, or All Contacts. If you set your auto-reply to Favorites, it only goes to those people you’re in contact most. If you don’t want anyone to know when you’re in the car, choose No One. Enter a custom reply message. If you need to get a message through to someone who has DND While Driving active, follow up your first message with a second that only says ‘urgent’. 5/ How to tell if Apple Watch notifications are from a native app or an iPhone app — Sometimes when you get a notification on your Apple Watch, you can tap on it for further options, or to open a corresponding app. At other times, that notification is from your iPhone, and there’s not much you can do with it other than dismiss it. Here’s how to quickly tell the difference — it’s all in the shape. App icons on watchOS are circles, and when you get a notification from an app that is native to the Apple Watch, tapping on it will open the corresponding app. When an alert arrives, or you are browsing through past ones in Notification Center, the corresponding app icon is located in the upper left. If it’s a circle, tapping once will provide quick options like reply or dismiss, and tapping a second time will open the corresponding app. But if the icon is a square, that means it’s simply an iPhone notification because app icons on the iPhone are rounded-corner squares. There aren’t as many options for dealing with notifications not from native watchOS apps. Tap and you’ll have an option to dismiss, with no second tap to open the app, because the app is only on your iPhone.